Is it a bird? Is it a plane? No! It's the Imperia Pasta Maker - God's answer to Italian restaurant-quality pasta created from your very own kitchen at home. What could be better? You get home after a day out with the family and everyone's starving - aren't they always?! ;-) Everyone's screaming out for carbs so what do you give them? You give them pasta, but not just any pasta of course - Imperia pasta made with the Imperia pasta maker. Forget your cheap knock-off pasta machines that fall to pieces like driftwood in a typhoon. When it comes to making your very own pasta you want the best. 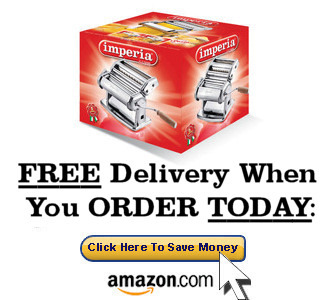 You want the Imperia Pasta Maker that comes complete with its very own steel-wooden turning handled, precision-engineered pasta rollers and an Imperia recipe booklet to boot. You set the thickness of the pasta to your liking (or to your kids' liking) and the Imperia sp150 Pasta Maker does the rest. Just a few swift turns of the handle and out slides beautiful, delicious scrummy pasta - every single time. The imperia sp150 machine does the job perfectly. The great thing about making your own imperia pasta is that once the deed is done you don't have to sweat about some monstrous tidy up operation in the kitchen because all that is taken care of. Forget about having to soak your pasta machine or scrub it down like a dirty 4 x 4. No - just a quick wipe with a warm soapy cloth and you're all set. Fantastico!